We are looking for volunteers to provide extra eyes and ears to help ONAPA alert preserve managers to basic problems that may be present in the preserves such as vandalism, invasive species, litter, broken boardwalks, trees down on trails or boardwalks, deteriorating signage, etc. Your report information will be shared with the Natural Areas Program staff and will help to identify potential volunteer stewardship projects. ONAPA will conduct volunteer training sessions introducing preserve information and the various invasive species that are threatening their ecological integrity to assist you with this effort. Below you will find guidelines to assist you with your effort. Register as an ONAPA volunteer using the online Volunteer form found HERE. Download, fill out and mail in the DNAP Volunteer forms found HERE. Determine which preserve(s) you wish to monitor. If a preserve requires a permit, contact the preserve manager to let them know you will be visiting that preserve. 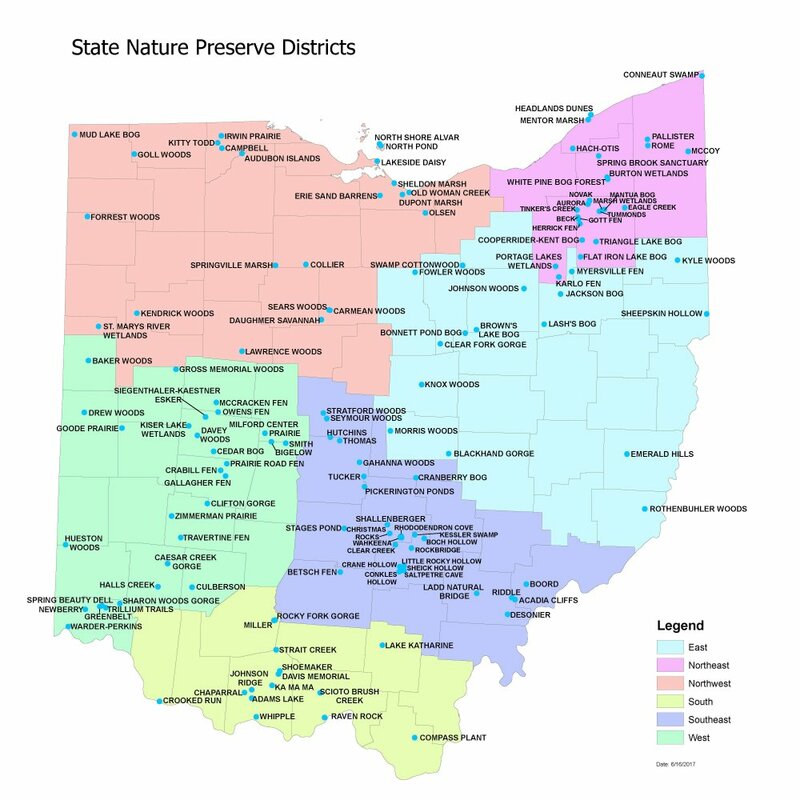 See a map of preserve and their managers below. Download the Preserve Monitoring form to take along on your visit so that you can record items as you see them. The form can be downloaded HERE and instructions HERE. Stay on trail unless you see human disturbance off trail that needs reporting or unless you are able be check boundaries using latitude and longitude information. If you plan on checking boundaries, let the preserve manager know. Items to report include the condition of trails, boardwalks, and signs; trash along trails and in parking areas; adequate or damaged signage; suspected illegal activities; presence of invasive plants; status of rare plant populations; and any other condition you find. Take photos as needed for submission. If you see an item that requires immediate attention please email the preserve manager directly with this information and include this information in your report. ​Complete the paper form, scan it and email it along with any photos to Reports@onapa.org or use the online form to enter your report found HERE. Using our online form, enter your volunteer hours including travel to and from each preserve which can be found HERE. Regardless of how you submitted the report, send labeled photos to reports@onapa.org . Download the Preserve Monitoring Program guidelines along with Preserve Manager contact information HERE. ​Other volunteer opportunities can be found HERE. Sign up as an ONAPA volunteer and let us know how you would like to help.